Yard Waste Stickers are available for purchase at the Palatine Township Center located at 721 S. Quentin Road, in Palatine. Stickers are sold 8 stickers to a sheet at a cost of $4.00 per sheet. 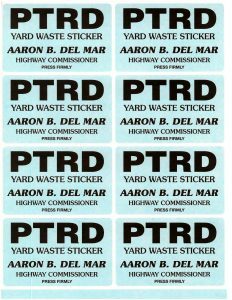 These stickers are to be used on yard waste bags that you purchase for the following items: grass clippings, leaves, twigs, garden debris, weeds, stalks vines, bark and wood chips. Please do not put more than 40 pounds of material in bags. Fill the bags up to 6″ from the top and fold or tape shut. If you have small brush and branches, you can tie them up with twine in bundles 4 feet or less in length and 2 feet or less in diameter. By tying them they will be easier to lift into the truck. Finally, place bags or bundles at edge of pavement before 7 a.m. the day of your scheduled pick up. Again this year Plum Grove and Forest Estates Subdivision will be on Monday while Lake Park Estates, Barrington Trails, Fielding Place, Howe Terrace and Thunderbird will be on Tuesday.